ISU's Hancock Stadium on Friday in Normal, Ill. Gaining momentum like a snowball rolling down a hill into the abyss, the second week of the 2010 Drum Corps International Tour will kick off with two Sasquatch-sized events Friday, June 23. First in the Midwest, the DCI Central Illinois Premier Event returns to the campus of Illinois State University in Normal, Ill. with eight World Class corps on the lineup card. Not only will this be the very first competitive performance of the Blue Stars, it will also be the first Midwest matchup of the season between three of last year's top four: Carolina Crown, the Cavaliers and the Cadets. Fans will see the very first scores of the season rolling in from the West Coast late Friday night, after the Clovis, Calif. Mid-Cal Tour of Champions wraps up with performances by the Blue Devils' World and Open Class corps, Santa Clara Vanguard and Vanguard Cadets, Mandarins, Pacific Crest, Troopers, Blue Knights and Revolution. This same lineup with the addition of the all-age Renegades, will take the field again on Saturday, June 26 for the DCI West Premier Event held on the campus of Stanford University. Drawing fans from all over the Silicon Valley and beyond, this is always one of the biggest and most popular events of the year in California. Drums on Parade Saturday in Madison, Wis., will feature 10 corps including all of the Badger State greats –Madison Scouts, Blue Stars, Pioneer, Racine Scouts and the all-age Kilties. Also headlining will be the Cadets and Cavaliers, who are definitely no strangers to the area. The two groups have won an incredible six of the seven DCI World Championships hosted in this legendary drum corps city. Out east, Saturday will have a more academic theme as the DCI Salutes America Premier Event is held in conjunction with MENC: the National Association for Music Education's Music Education Week in Washington D.C. Phantom Regiment will be special guests of the Marching Music Academy, a brand new two-day educational workshop for band directors sponsored by Drum Corps International. The evening competition at Wakefield HS in Arlington, Va. will mark the first 2010 performances of the Boston Crusaders and Jersey Surf. An already jam-packed weekend of marching music action continues across the United States on Sunday, June 27. One half of the West Coast corps will get at it during the longstanding Moonlight Classic in Stockton, Calif. In the Midwest, the majority of corps who performed in Madison on the 26th will hit Interstate 94 for a 250 mile jog northwest to Stillwater, Minn. for Drum Beauty. The other half of West Coast corps will see action in Atascadero, Calif. for Brass Along the Central Coast. The Thunder of Drums (St. Peter, Minn.) on June 28, cures a case of the Mondays for fans by featuring some of the Midwest's best including the Cavaliers, Blue Stars, Colts, Pioneer, Colt Cadets, Racine Scouts and the all-age Govenaires. The Cadets will also be in the lineup at this show as the sole representative of the East Coast. In Ewing, N.J. on Tuesday, June 29, Drum Corps - An American Tradition gets an early jump on Independence Day patriotism with a special recognition of military service members along with the competitive performances of seven World Class corps. The last day of June offers a series of events spread across the map. The West hosts an event in Medford, Ore. on Wednesday. In the Midwest, the Colts and Colt Cadets will perform for a hometown crowd at Music on the March. In the East, Ft. Edward/Glens Falls, N.Y. hosts the 30th anniversary edition of the Adirondack Drums competition. Corps return on Thursday, July 1, to Oswego, Ill., a Chicago suburb with a long history of early-season DCI events. 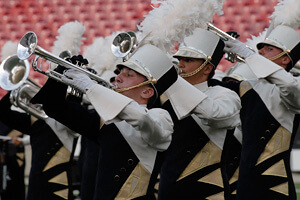 The 2010 Festival of Brass will feature eight corps including the Madison Scouts, Cavaliers, Glassmen, Colts, Pioneer, Teal Sound, Racine Scouts and Colt Cadets. Coming up in week three …Fourth of July festivities; a return to the Rose Bowl; more events north, east and west. 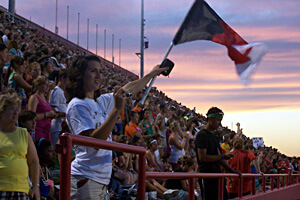 View the complete schedule of 2010 DCI Tour Events.